Heather Presha has been in the Real Estate industry for over 10 years. She began her career as a top producing loan officer at Wells Fargo Home Mortgage. Five years later she dove into the world of Real Estate Sales at Keller Williams Realty where she was named the #1 Residential Real Estate Agent in her office. Heather specializes in the South Los Angeles area and rightly so, as she has been a resident and a proud community activist since 2001. 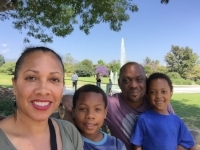 Although she does business all over the Los Angeles Metro area, she has a special love for the Crenshaw Community, including Windsor Hills, Leimert Park, Baldwin Hills, View Park and Park Hills Heights. Heather loves what she does and loves to see her clients win! Over the years, she's built her business on referrals -- taking one client at a time and simply doing a great job. When Heather is not handling Real Estate business, she is a devoted wife, active yoga practitioner, loves the beach, reading, meditating and playing tennis with her boys. She is also a community volunteer for such organizations as the Leimert Park Village Stake Holders and The Metro's Eat shop Play Crenshaw. She's a former Leimert Park block club captain and Community liaison for the LAPD. For those buyers or sellers who are in search of a true advocate with the right connections, solid wisdom of the South LA area and a prideful approach to fulfilling client goals--Heather is a great choice!